A team of researchers from Neuroscience Research Australia has received a grant from The Michael J. Fox Foundation and the Shake It Up Australia Foundation for Parkinson’s Research to test smart garment technologies to help prevent falls in people with Parkinson’s disease. The grant will be used to develop the StandingTall-PD Study, a neuro-rehabilitation program that aims to prevent freezing-of-gait and falls, and enhance participants’ independence. The program uses visual, audio and sensory cues to help rewire the parts of the brain that control walking in people with Parkinson’s and involves Smart Socks with haptic feedback and core microelectronics. Participants will receive a NeuRA training mat with colour-coded stepping targets, a pair of Sensoria Smart Socks, an iPad and phone. Participants train daily, stepping on coloured targets on the mat that match a series of colours displayed on their iPad. 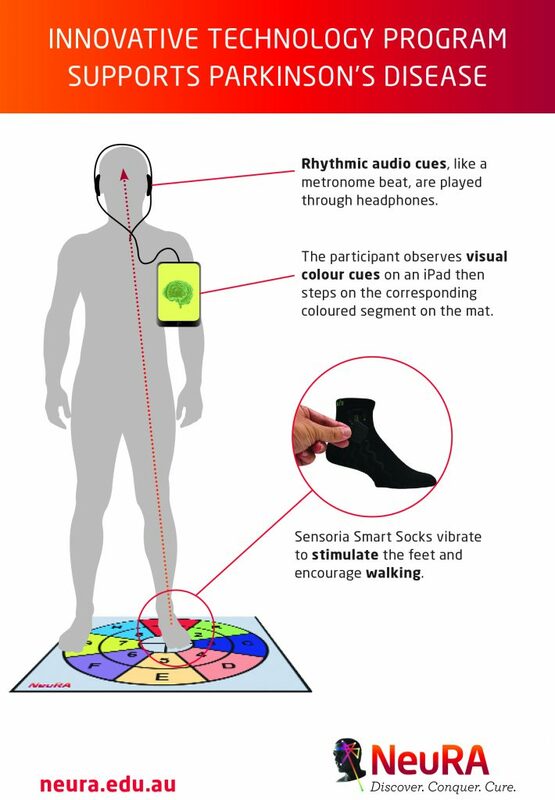 At the same time, they will listen to rhythmic auditory cues like music or a metronome beat that are synchronised with the vibrating Smart Socks. The Smart Socks buzz to engage the feet when they detect an altered pattern in walking that suggests a fall is about to take place. The combination of visual, audio and sensory elements helps to form new connections in less affected parts of the brain, leading to improved walking ability. Participants can self-manage and monitor their own progress via an app on their phone. The app can also trigger stimuli during everyday activities, such as vibration in their Smart Socks, if they are in danger of experiencing freezing-of-gait, falls or if they show signs of shuffling feet.